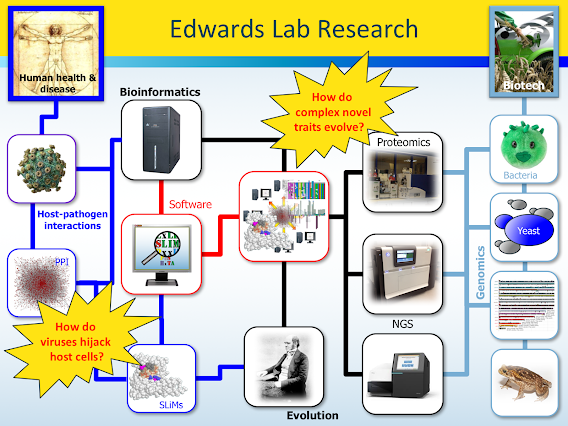 The Edwards Lab began in September 2007 at the University of Southampton but had its roots in Dublin the lab of Prof Denis Shields, where Rich was a postdoc. The Shields lab, now at University College Dublin following a move from the Royal College of Surgeons in Ireland, remains a strong collaborative partner in much of the research, particularly that surrounding Short Linear Motifs (SLiMs). This page was created in 2013 when the Rich was preparing to move from Southampton to the University of New South Wales in Sydney, Australia. As you can probably tell, it is still a work in progress and material will be migrated from the old lab homepage over the coming weeks.